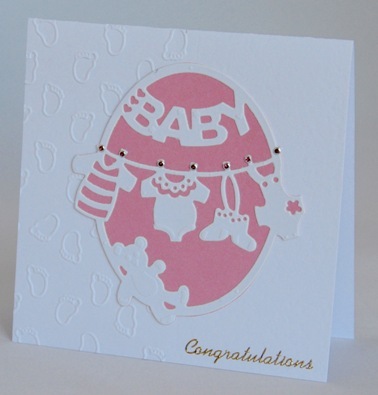 I have embossed baby footprints on the left hand side of the card. On top of this I have layered an oval of embossed baby clothes which is set on either a pink or blue background. Tiny glitter dots in a co-ordinating blue or pink act as clothes pegs. The word Congratulations is written in gold lettering at the foot of the card which is blank inside for your own greetings. The design is available in blue or pink – please let me know which colour you want at the checkout. If ordering by phone, please reference card #702.